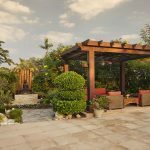 Designing your outdoor space can be overwhelming, but working with a landscape architect doesn’t have to be. Here are a few helpful questions to ask your potential landscape designer to ensure that they are a good fit for your project. How long have you been specializing in landscape design? It’s important to know the amount of experience any potential landscape designer has under their belt. Ask to see their landscape design portfolio and check out their website to review any client testimonials. This will give you an idea of what your potential designer is capable of producing. Before answering this question, any reputable landscape designer will need to physically visit your yard. During the first visit to a garden, a potential designer will note where the shade and sun fall in your yard, what the soil is like, or where property MEP are located. They may also take notes on any existing features they might incorporate into the design (such as big trees or views). This will all play a vital part in your final landscape design plan and are specialists in gaining vital information called the “ Design Brief”. Not all landscape designers are the same. Some designers specialize in Modern Landscape Design, while others may specialize in creating personal Zen gardens. If you have a specific vision in mind you need to know that your designer is capable of producing the aesthetic you seek. Landscape architects have different ways of approaching a project. During the first visit, some designers may snap photos of the space or perhaps sketch out a rough concept or two to give their client a visual. A more detailed conceptual drawing follows, along with a general project description to discuss with the client. Landscape designers often interview the clients as much as they are being interviewed. This is very common, as you will working together to bring your vision to life and you want to ensure it’s a great fit on both ends. This may seem like a simple question, but it’s an important one. The duration of your project will depend on the size and scope of the landscape design. Don’t be surprised if your contractor provides an estimated time frame upfront, rather than a fixed date. Keep in mind that weather, suppliers or the contractor’s work schedules could alter the timeline. If you have a specific timeframe in mind be sure to let your landscape contractor know. Whether you are operating on a fixed budget or with unlimited funds, you need to be aware of the cost of your landscape design before starting the project. Most estimates are calculated taking into account square footage and what you want to include in your design. Do you want to include a pool or an outdoor kitchen? Additionally, water features, custom lighting and decorative paved paths may add to the overall cost of your project. Be sure to clearly express your project budget before starting your landscape design project. There may be some wiggle room to lower the costs of the project as well. For example, when it comes to materials widely spaced concrete pavers with plants between are more cost effective than ornate solid paving. Some landscape contractors charge for their services at an hourly rate, with a not-to-exceed amount, while others charge one lump sum based on the scope of work. A less common method in the landscape profession is to charge as a percentage of construction costs. It’s important to know who you will be charged for the landscape designers services. A design and build service is given by quoting for Design fees separately and giving the execution cost separately. Any other third parties involved in the landscape design process? Not all landscaping companies are full-service providers. They may contract out portions of the project to third parties. For example if you want a custom designed Pergola or Gazebo for your backyard your contractor may need to outsource that portion of your design project. However, a full-service provider such as Milestone has an on-site carpentry warehouse to handle all custom wood design. Knowing this beforehand will give you a better idea of who will be operating on your project and whether or not it’s your responsibility to find other necessary professionals. What’s the process once you are hired? Once the plan, project timeline, budgets are approved, any changes made, and the contractor is hired, work will begin on your new landscape design. Will you be in direct contact with the designer, or will your project be managed by another staff member? Great communication is essential throughout the entire design project. It’s important that you know exactly what the process is for the scope of your project. Do you provide landscape maintenance services? Designing your dream landscape is only the beginning. 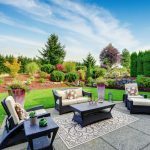 Be sure to ask the landscape contractor if they provide lawn care and upkeep services to ensure that your newly planned oasis will stay lush for a very long time! 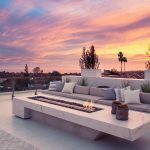 People turn to talented landscape designers to create their outdoor living spaces and to discover creative solutions to their landscape challenges. However, you can’t just show up to an initial meeting with only a few books about plants and decor. Asking the right questions is the first step along the path pebbled path to your dream landscape design!